This Friday (July 22), P Money will be hitting Fabric for the latest in his Originators club nights, and he&apos;s bringing along a mix of established dons and rising stars. He&apos;ll be joined on the night by OGz, Logan Sama, Sir Spyro and Capo Lee, Rude Kid, Splurgeboys and Pap, Turno and Eksman, Sian Anderson, A.G., Intense, and junglist madman Remarc. 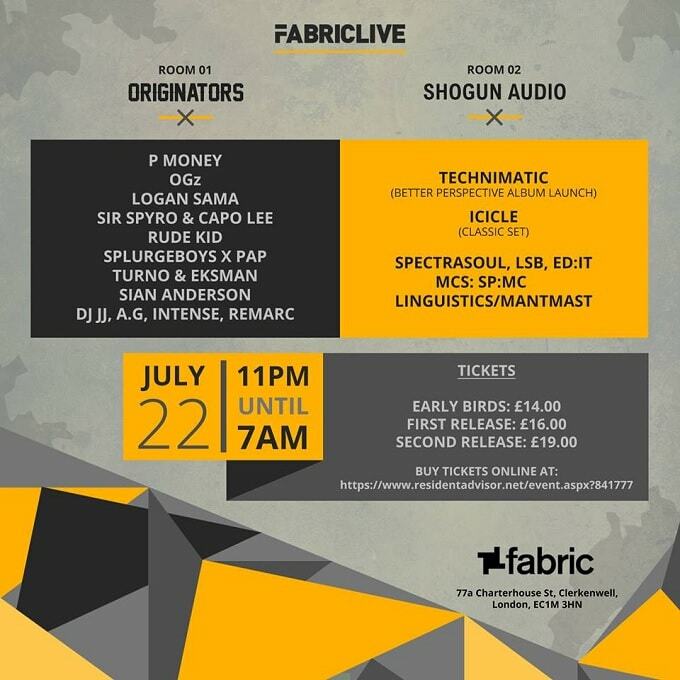 Meanwhile, in Room 2, Friction&apos;s Shogun Audio will be bringing their D&B lunacy with sets from Technimatic (who&apos;ll be launching their Better Perspective album), a "classic" set from Icicle, SpectraSoul, LSB, Ed:it, with MCs SP:MC, Lingusitcs and Mantmast. It all kicks off around 11pm. Head here for tickets and more info.